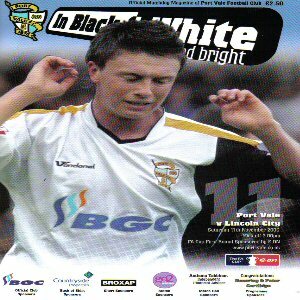 I must admit, without trying to sound disrespectful to Port Vale, that I was quite disappointed by drawing them in the first round of the FA Cup in 2006/7 season but then again, it was a chance to visit a new ground in the country after missing our last game there 5 and a half years earlier. Getting to Burslem (the town the ground is based in for the geographically challenged amongst you) was a lot easier than I'd expected and there are plenty of places to park around the ground. 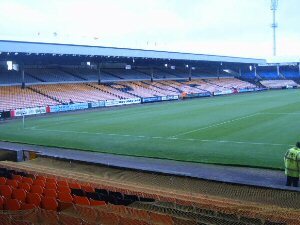 The club shop at Vale Park is huge and one of the biggest never to feature in the Premiership, it sells all kinds of random stuff in there such as slippers, cricket bats, pool cues and even bowls. However, finding the away end is slightly tricky if you don't notice the signs because the length of the away end which is the stand nearest to the road you approach on, is quite a fair distance. Once you get into the away end, you begin to question the capacity levels some websites claim it to be as there is not a chance in hell that this ground holds 23,000odd seats, especially as half of the main stand has been left unbuilt. This stand is to the right of the away fans and has 3 tiers of seating, however the top 2 are obviously just for executives as they are really too small to be general seating areas. The stand opposite the away end is a 2 tiered stand but is also fairly small and only looks to hold around 3,000 at the very most. Next to that (to the away fans left as they look out) is a stand that reminds me of Craven Cottage and then it's round to the final stand, another 2 tiered effort. The away end itself is single tier and although not a bad stand, is far too shallow to get a good view of the action. 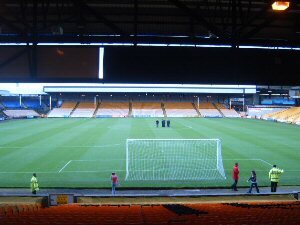 Overall, the ground is good by lower league standards but still doesn't feel like a footballing ground and the atmosphere is near enough non-existent and although that could possible be because of it just being the FA Cup but you can't ignore the virtually non-atmosphere. The chances of going to this for a random game is highly unlikely.